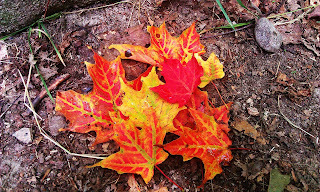 AMC Conditions: Fall is just around the corner! Happy September! During my hike yesterday to continue my ongoing quest to finish the 4,000 footers up to Mt. 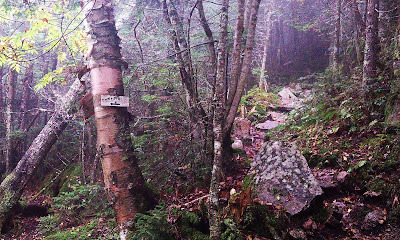 Waumbeck in Jefferson, NH I started to notice the leaves on the trail are changing colors! Although the bright orange and red leaves were not throughout the entire forest, the hues are most definitely changing and peak foliage should be here in a few weeks! The Starr King trail is a beautifully maintained trail by the Randolph Mountain Club (RMC) with yellow blazes. 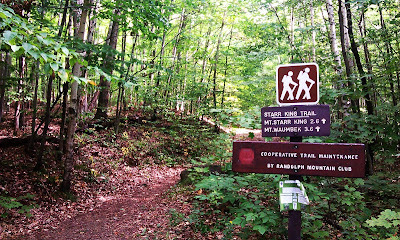 The trail starts on Starr King Rd in the town of Jefferson, NH where it diverges to the left on a dirt road to the parking lot to where the trailhead begins. 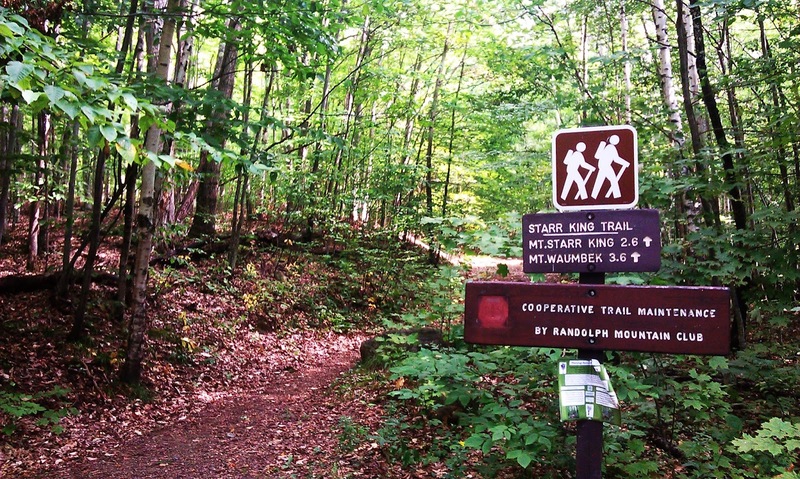 This trail starts as a moderate gradually inclining trail to the intersection of the original trail, an old grassy logging road, and then has a a nice ascent up to the summit of Starr King, about a 1,400 foot gain within 2.8 miles. 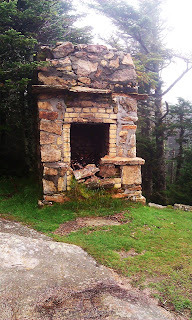 Along the way you pass a nice spring and on the summit of Starr King (there is no sign marking the summit) you can see remains of the old cabin's fireplace. 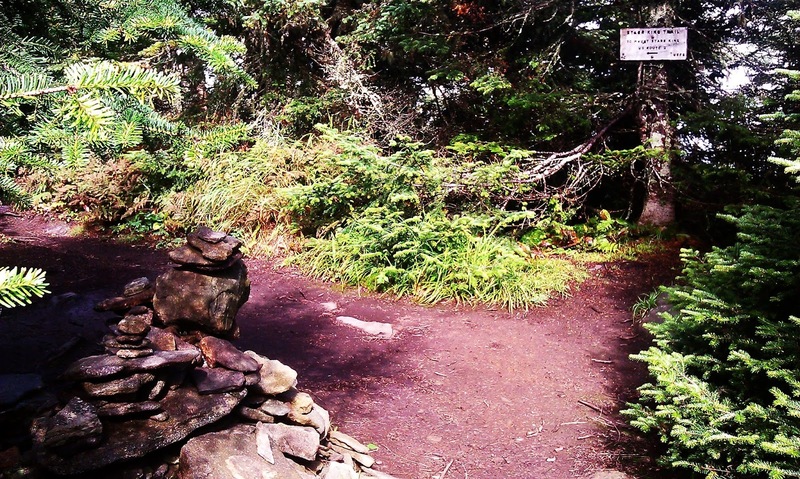 After this steady gain in elevation the trail flattens out to the crest of the ridge to the summit of Mt. Waumbeck to where the summit is marked by a carin right before the Kilkenny Ridge Trail. Although there was not terrific views the day I was there, there are views on a clear day on Starr King and also 50 yards ahead on the Kilkenny Ridge Trail where a short side path has a view of the Presidential Range. This was a great day hike and I ran into other hikers who were also in pursuit of their 48 4,000 peaks. For more information on the 4,000 footers please visit http://www.amc4000footer.org/ Until then, stayed tuned as we will be doing more updates as the colors change!